Happy fall, hops fans! Along with the pumpkin-spiced glory that fall brings, it’s also finally Oktoberfest season! This week’s festivities mark the 185th Munich Oktoberfest and if you’re at all like the crew around here, you’re still browsing last minute flights to Germany to get in on this totally immersive beer celebration. We’d like to kick off this beer-centric holiday season by diving into the history of the festival and how to build your own Oktoberfest with some of the same celebrated charms. The very first Oktoberfest, held in October of 1810, was actually part of a 5-day wedding celebration for Bavaria’s then Crown Prince Ludwig and his new wife, Princess Therese. Since then, crowds have returned to the Theresienwiese fairgrounds year-after-year to get their fill of German beer, food, and culture. While the Munich festival’s start date has since shifted into September to allow for better weather conditions, it is now the largest festival of its kind and the Oktoberfest spirit of has caught on with brewers and beer fans around the world. Prep some Classic German Foods: Ready to think beyond pretzels and sauerkraut? Serve up some german potato salad with a batch of these tasty bacon wrapped beer brats and get ready for your guests to start asking about your plans for next year’s Oktoberfest. Be sure to finish the feast with some apple strudel or yummy gingerbread! Build a Party Playlist: Help set the party mood for a Theresienwiese-worthy festival with this playlist of fan favorites of all types. Lederhosen optional. Grab Some Oktoberfest beers: Here’s where we are FILLED to the brim with ideas. Our recommendation is to aim for a beer fest style variety by encouraging your guests to bring along some of their favorite Oktoberfest beer or by creating a sign-up sheet. Just be sure to have a supply on hand before the party begins to get the party rolling. Read on for some tasty brews we adore! Want to serve up the most authentic German Oktoberfest beer you can find? Check out these classics out for a solid DIY fest flight. While these brews may not hail from Munich, each one is a solid ode to the Oktoberfest style of beer. 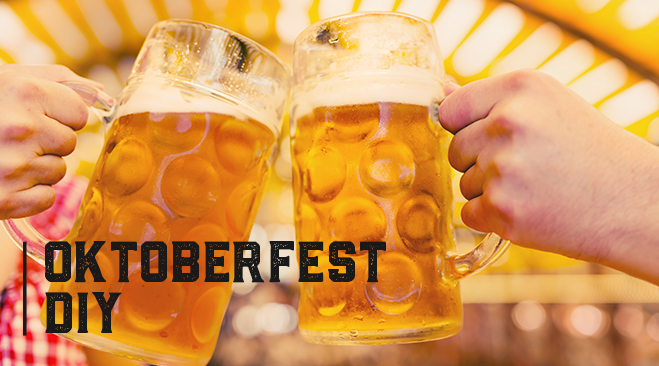 We hope you enjoy your Oktoberfest celebrations – feel free to share photos tagged with #HDOktoberfest! Prost!